3.0 out of 5 starsFine ring, but not like depicted. 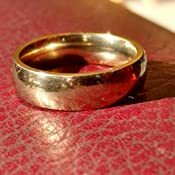 I purchased this ring as a temporary ring for my husband while we had his worked on. It was cheap, which was nice, and overall it's fine. However, it doesn't really look much like the rendering. 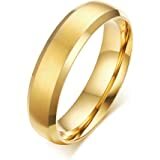 It is not a matte texture, and instead of the edges of the ring having a full curve, there is a flat edge. For a cheap ring, it works fine though was a little larger than the size we ordered. 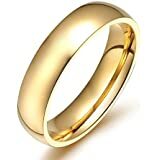 If you're wanting a ring that looks like the image, though, look elsewhere. 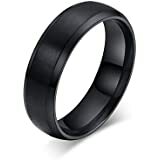 I bought this ring because I had a similar ring that was tungsten carbide. 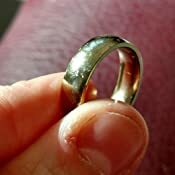 I found it was too heavy for my fingers, and the stainless steel one was not comfortable. I've had this ring for about a month. Now, I do do Army trainings and exercises, so I have put some wear on this ring (I'm also not the most gentle person either). It arrived on time and in perfect condition. I noticed that it was really, really yellow. Almost fake looking. Though, I loved how light it was. In the pictures, you can see that, after a month, its pretty scratched up. 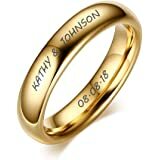 I'm okay with this (personally I feel weird with a pristine wedding band) but others might not be. Biggest negatives? Its pretty easily scratched, and looks almost too gold at first. While it is a comfort fit, there is a very slight edge to it. Positives? It is amazingly light! The size was exact. 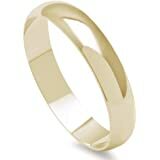 Also, after a while, some of the gold plating wears off, so it is a more believable gold band. It is also very, very comfortable. I usually play with my rings when they aren't that comfortable, but this one is so comfy and lightweight, it has stayed on for a long time! 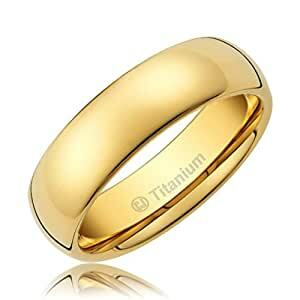 Beautiful plain wedding's ring!IIt's so light that you can barely feel it on your finger.Very good looking and also so comfi.just hat I was looking for.Also true that I had tungsten before but this is super light on my finger! Great size, great price! Came very quickly! 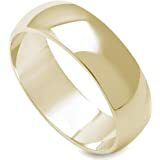 It's very comfortable for someone new to wearing a wedding band. I would buy again. Could have easily be 4 start if not lost a color. 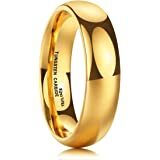 I would give 3 and half start since I kept the ring all the time in my hand like all day long, while taking shower, while playing badminton, when I am jogging. 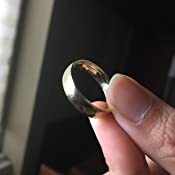 Excellent luster and very sturdy ring, though it almost feels costume-y from a weight standpoint (a lot lighter than my husband's regular gold band). The titanium seems to stand up well, and while he's having to take off his ring regularly at work, this is an excellent stand-in in case it gets misplaced. 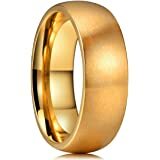 Aside from the light-weight feel, it's a wonderful sturdy band and a lot cheaper than keeping a second 14k gold band as a backup. 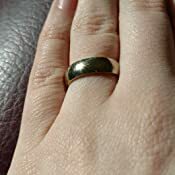 My husband wore my grandfather's ring at our wedding, and after having it re-sized 3 times, I decided to just pick up an affordable second option. He actually likes this one more, and even though it's wider than the original band, he finds the comfort fit makes it less noticeable and helps it stay on. And, since it wasn't hundreds of dollars, we can get another if it starts to wear/scratch (so far it hasn't) or if he loses it. I'm actually thinking about getting one myself, especially for when we travel.